Many of the changes of the digital era came because older folks ("digital immigrants" like me) adopted new behaviors, but most of the inertia for business evolution occurred when a wave of "digital natives" came of age. What will happen when the current batch of young "social natives" reach their adult years? A lot, and this will require businesses do far more than just add to the IT stack and hire a couple community managers. In the mid- to late-2000s, the Gen Y cohort--people who almost could not remember a time (and could not function) without PCs and the Internet--joined key advertising demographics, reached voting age and entered the workforce. Many companies anticipated this and had deployed digital strategies early, but some waited for the mid 00s before shifting significant ad dollars online, adopting email and online service channels and developing new digital products and business models. Companies bound to old business models struggled to adjust to new realities as their customer demographics rapidly changed. One example of how the last major demographic shift swamped an industry is the photo business. Shutterfly and Ofoto, two early photo-sharing sites, launched in 1999 at a time when Kodak had a market cap of almost $22 billion. The startups foresaw the wave of change to come with young people adopting digital photography. Kodak waited two more years before getting into the photo-sharing game (by purchasing Ofoto, later renamed Kodak Gallery), but it never really understood how Gen Y was changing the photo business. Kodak Gallery didn't permit sharing in the same way as its upstart competitors, kept photos locked behind a registration screen, and in 2008--just as the use of mobile phone cameras was exploding--Kodak implemented an ill-fated program requiring customers to purchase items or lose their stored photos. How did that work for Kodak? Since January 2005, when Kodak launched its rebranded online photo-gallery service, its stock is down over 99%. 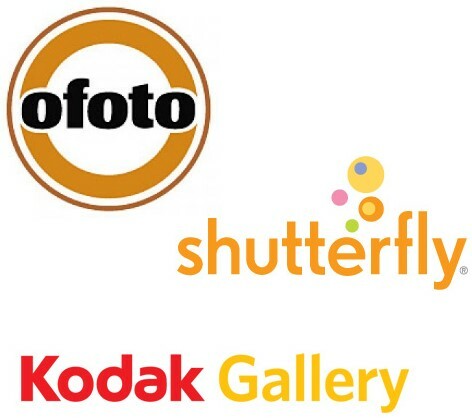 Currently, Shutterfly is acquiring Kodak Gallery for a mere $23.8 million and Kodak is restructuring. Shutterfly was the only bidder in a sad auction for Kodak Gallery, which gets fewer than a million visitors a month, down 29 percent in one year. Many of today's leaders do not understand what it will mean to serve, sell to, market to or employ the new generation of social natives. The answer is not merely to have a corporate Facebook presence, advertise with Promoted Tweets and host a community on the company intranet. Social natives will bring vastly different attitudes and expectations into their adult years, and this will force changes in the way we steer our brands, conduct business, set policies, devise organization structures and manage employees. Soon, we will need to employ and build relationships with people who are disconnected and awake less than an hour a day. (Any longer and it "creates an unnerving sense of disconnectedness.") We all know business hasn't been 9-to-5 for a long time, particularly for global brands, but serving a generation constantly connected and demanding of non-stop brand care and interaction is going to require an even greater focus on deploying a 24/7 enterprise. Think of how quickly this single aspect of social demographic behaviors is changing our world. On a personal level, few of us employed in marketing, PR or social media ever truly disconnect any longer, and on a business level, most large organizations already deploy community management well beyond old-school "working hours." Still, few companies have significant numbers of service staff deployed round the clock. Soon, it will take more than a skeleton second- and third-shift crew to meet the needs of never-disconnected "social natives." The customer who tweets a customer service question at 1 am will likely have no different an expectation about response time than the one who tweets at 1 pm. The generation of social natives also evaluates its brand preferences differently than their parents. TV advertising? It's not dying, but neither is it going to be as effective as in the past. ComScore recently found that millennials are less likely to say they found a TV ad interesting, believable or likeable, and they are more likely to call it irritating. If younger folks don't believe in TV ads, what do they rely upon? 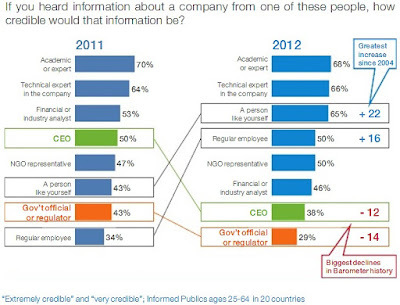 It sure isn't corporations--37% of millennials claim to distrust big business. 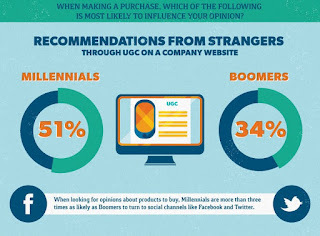 Instead, social natives trust others; Millennials are 50% more likely than boomers to say that recommendations from strangers influence their opinions. "If you ask a bunch of Gen Xers [born in the '60s and '70s] what they would do if they didn't like where they worked, most would say 'leave.' But if you ask millennials that question, their attitude is, 'Someone will fix it.' They'll start IM-ing each other, a few will get Mom and Dad on their cellphones, someone will call the local media, another will alert the congressman." "The 16 attributes... responsible for shaping current business trust levels are largely tied to business competence, and those that will build future trust are more societally focused. Listening to customer needs, treating employees well, placing customers ahead of profits and having ethical business practices are all considered more important than delivering consistent financial returns." Find physical interaction less vital--nearly seven in ten say sometimes talk to friends online instead of driving to see them. Are willing to drive less if options are available--those under 34 are almost twice as likely than people over 55 to be willing to drive less, provided public transportation, car sharing or convenient carpooling is available. Are ready to buy less and participate more in the sharing economy--compared to consumers over 55, those under 35 were approximately five times more likely to participate in car sharing and home- or vacation-sharing programs. Is your enterprise prepared to sell to, rent to and employ a generation that is always on, empowered and prepared to take action, highly networked, more influenced by peers than ads, distrustful of big business, unforgiving of companies that aren't transparent, disinclined to conduct business with organizations that do not stand for something and more willing to share and rent than buy and own? 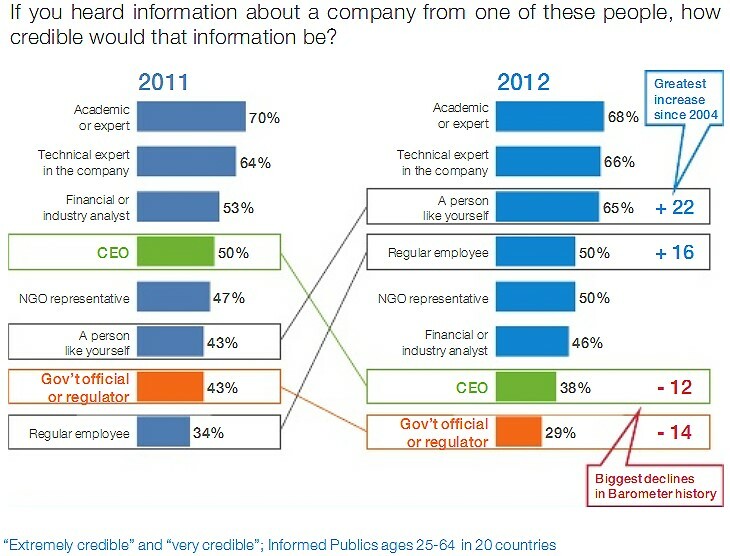 What will happen when the current generation of ROI-maximizing, privacy-protecting, production-oriented, quarterly-obsessed CEOs runs headlong into a new generation that expects organizations to listen, make the world better, be transparent and commit to long-term societal missions? Many companies think they know the trends and are comfortable planning for change in the future, but they are not really prepared. 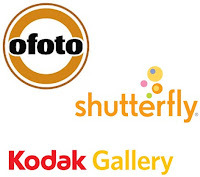 In 2008, when Kodak was comfortable with its decision to make sharing difficult and to force users to buy something or have their photographic memories deleted, it had a market capitalization of over $5 billion and Shutterfly was worth less than $200 million. Today, Shutterfly has a market cap of $1.1 billion and Kodak is in bankruptcy with a market cap of $77 million. Of course, even innovators need to play by market rules, and later today Shutterfly announces its latest quarterly earnings; it may have bested the giant Kodak, but with social natives seeing no need to print photos given Facebook's (not to mention Twitter's, Instagram's, and Flickr's) free storage services, even Shutterfly could get crushed in the next demographic wave. In very short order, social natives will be your customers and employees. Time is not a luxury today's businesses can enjoy when considering the evolution required in the next five years. For decades, technology has chipped away at TV. VCRs, streaming Internet video, file sharing, DVRs, on-demand cable and mobile video provided TV alternatives, decreased TV's audience, increased time shifting or encouraged ad skipping. One of the intriguing things about social media is that it is the first technological advance that really benefits TV without specifically being about TV. Of course, television was social before we had social media. TV shows drove "water cooler" chatter since Lucy Ricardo gave birth to "Little Ricky"--71.7% of all American TV sets were tuned to "I Love Lucy" the night Lucille Ball's character gave birth in 1953. Crowdsourcing is not new to television, either; letter writing campaigns to save TV shows date back to at least 1968 when fans got NBC to renew "Star Trek" for another season. The fact TV viewing is innately social makes it the perfect match for today's social media and mobile technology. With the real-time sharing that happens via social media, it once again seems exciting and necessary to watch live TV. No one wants to see spoilers of their favorite shows--a recent TV Guide study found that 27 percent of us are watching more live TV to avoid plot and reality spoilers revealed on social networks. People may hate them, but don't expect TV networks to make it any easier for you to avoid those spoilers; hashtags are popping up in the corner of TV screens to encourage viewers to join the dialog on Twitter. According to Chloe Sladden, Twitter’s director of content and programming, those perpetual hashtags can at least double the amount of activity and could drive as much as 10 times the tweets. The desire to join the conversation is a huge way social media is driving live TV viewership. What fun is it to tweet your love, shock or disappointment in an episode days after everyone else has seen it? Tweeting about last week's episode of Fringe makes as much sense as tweeting, "OMG, Mulder just told Scully that he loved her!" In our fast-moving world, it doesn't matter if it was last week or last decade--it's all ancient history as of this moment. The power of real-time social media to drive TV viewership was demonstrated last year when Charlie Sheen made an 11th-hour appearance on CNN's "Piers Morgan Tonight." Though the show had almost no advance promotion, social networks lit up once the interview began, and 45 minutes into the show, viewership in the 25-to-54 demo was up 61%. Networks are also encouraging real-time social media engagement with their shows by making stars and reality TV contestants available to fans. The competitors on The Voice are encouraged to tweet and connect with their fans, quite a change from when American Idol prevented contestants from having active Myspace pages or Twitter accounts. 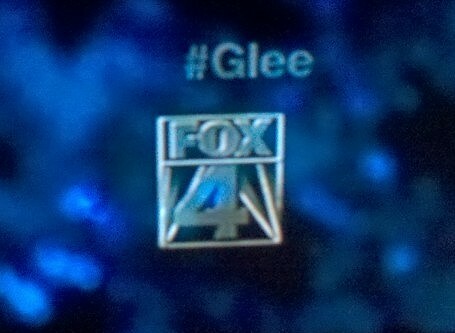 In addition, more and more networks are increasingly featuring stars in Twitter chats while their shows are broadcast. The growth of mobile technology is powering multitasking and sharing while watching TV. According to Elizabeth Shaw's recent Forrester report, almost two-thirds of Gen X and three-quarters of Gen Y consumers go online while watching television. 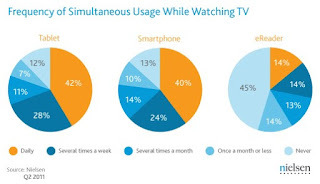 Further evidence comes from Nielsen, which found that 88 percent of tablet owners and 86 percent of smartphone owners used their devices while watching TV at least once during a 30-day period. It turns out this behavior is extremely common--roughly two-thirds of these folks use their device while watching television at least several times a week. Today's Social TV is being powered by more than just Twitter and Facebook; new sites and tools such as GetGlue are focused on increasing social engagement around live TV. GetGlue only has 2 million users, but it has already driven 100 million check-ins (although entertainment check-ins have a long way to go to catch Foursquare's 2 billion location check-ins.) Many other tools, including some created by the networks themselves, seek to drive more Social TV activity. Other sites and apps include MTVWatchWith, NBC Live, IntoNow, Miso and show-specific apps such those for Bones, Celebrity Apprentice and New Girl. Between GetGlue, Twitter, Facebook, blogs and boards, lots of us are talking about TV, and this is not just common among teens; in fact, according to Nielsen, people who talk about TV shows online skew older. The 25- to 34-year-old demographic accounts for just 17 percent of the overall social media population but is responsible for 29 percent of those on sites talking about TV. All the check-ins, tweets and posts are having an effect. TV Guide's study found that 17 percent of respondents say they have started to watch a show and 31 percent say they have continued to watch a show because of a social impression. Another study by NM Incite, a Nielsen/McKinsey Company, found a complex relationship between social media buzz and TV ratings. 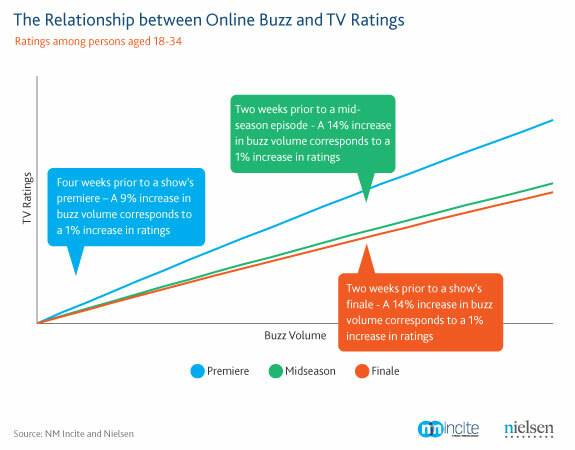 Buzz most closely correlated with increased TV viewership in consumers aged 18 to 34; in this demographic, a 9% increase in buzz volume around the time a show premiered correlated to a 1% increase in ratings, but as the season wore on, the relationship between the two variables weakened. However, with older viewers, social buzz had a greater impact on ratings toward the end of the season than at the beginning or middle. In addition to driving attention and viewership in shows, TV networks are also using social media data to tweak their shows to be more appealing to viewers. The producers of the 2010 MTV Video Music Awards focused more attention on Lady Gaga after her meat dress became a trending topic on Twitter. Simon Cowell, who once criticized celebrities on Twitter by asking, "Why would you want to talk to people like that? ", now uses audience feedback from Twitter to influence the format of The X Factor and tweets regularly at @simoncowell. New services such as Trendrr.TV are giving networks reams of data to measure viewer affinity not just for shows but also for granular attributes such as plotlines and characters. The opportunities in Social TV will only continue to grow as more case studies demonstrate success. The 2012 Video Music Awards (VMAs) is one such success story. MTV pushed the #VMA hashtag using a Promoted Trend and on-screen text during the broadcast. It also hosted an online “Twitter Tracker” site during the award ceremony and displayed the results during commercial breaks to attendees in the theater to encourage their participation online. MTV's microsite even featured a seating chart of the theater to see the spots from which celebrities were tweeting. The social promotion effort worked. Twitter saw over 10 million VMA Tweets, and the Promoted Trend had a 16% engagement rate, driving 27 times the average mentions of MTV’s Twitter account and adding 128,000 new followers to MTV’s Twitter account on the day of the event. The social media activity contributed to the success of the 2012 VMAs broadcast--it was the largest audience ever for any telecast in MTV’s history. How will social TV continue to evolve and change television? That is like a season-ending cliffhanger: You will just have to tune in next season to find out.